Gov. Rick Perry (photo) today ceremonially signed Senate bills (SB) 297 and 93, which significantly strengthens Texas' commitment to veterans and their families by enhancing their ability to apply their hard-earned educational benefits at Texas colleges and universities. "Military service places unique demands on the men and women in uniform and their families, and as home to the second most active military duty families in the nation, Texas owes it to them to support their families and welcome them honorably when they return," Gov. Perry said. "Last year, I called on the legislature to extend in-state tuition rates to eligible veterans, and Senate Bill 297 not only grants that request, but also extends that benefit to the spouses and children of our eligible veterans, and waives tuition completely for the children of Texas residents who have been deployed." SB 297 provides in-state tuition for veterans who are eligible for federal education benefits, and to their spouses and children. The bill also provides a tuition exemption for dependent children whose parent is a Texas resident deployed on active duty overseas. "Remembering our service members is more than just a moment of silence on Memorial Day, or the raising of a flag on Veteran's Day, it is an unwavering commitment to our veterans for their service to all of us," Sen. Leticia Van de Putte said. "As chairwoman of the Veteran Affairs and Military Installations, I am honored to play a role in remembering their courage and sacrifice and will continue to search for innovative ways to assist our veterans and their families. "SB 93 makes three important changes to the Hazelwood Act, which allows eligible veterans, their children and spouses to receive an exemption from the payment of tuition and most fees for up to for up to 150 semester credit hours of state-supported classes at colleges and universities. "It allows the spouse of a service member who was killed in action, died while in service, is missing in action, whose death was caused by a service-connected illness or injury, or who became totally disabled for employment purposes as a result of a service-related injury to claim the Hazelwood Exemption. "It creates the Hazelwood Legacy Act, requiring the Texas Higher Education Coordinating Board to allow veterans who are eligible for the Hazelwood Exemption to waive their rights to any unused portion of their maximum hours and transfer it to their child. Rep. Joaquin Castro said, "SB 93 will ensure that all honorably discharged veterans and their dependents receive the education benefits that we have promised. I am proud to have been a part of this effort for Texas veterans, who sacrifice so much for this country." "San Antonio has a strong history of support for both the military and higher education," Rep. Frank Corte Jr. said. "It is a great honor to see these bills which will benefit our veterans in obtaining their education signed here at UTSA." Governor Rick Perry ceremonially signed Senate Bills 93 and 297, Friday, July 31st @UTSA – 1604 Campus. Main building. Come out and support the re-election campaign of Judge Monica Guerrero, Thursday, August 6th @ Rosario's Restaurant & Cantina, 910 S. Alamo from 5:30-7:30 p.m. In order to keep you updated with what's happening in District 8, I will hold town hall meetings twice a month at our local libraries. These meetings will give you the chance to ask questions and provide input to me and city staff about current and future projects in our community. Please join me this Tuesday, August 4th, for our first town hall meeting. It will be held at the Igo Branch Library, 13330 Kyle Seale Parkway, from 6 p.m. to 8 p.m. Staff members from the Capital Improvement Management Services (CIMS) department will attend this meeting to provide a status report on road projects in the district. I look forward to seeing you and working with you to make our District 8 office and city government more responsive to your concerns. Campaign Kick-off Event honoring Judge Sid Harle, Thursday, August 27th from 5:30-7:30 p.m @ Zinc, 205 North Presa. RSVP by August 21st. 843-7521. 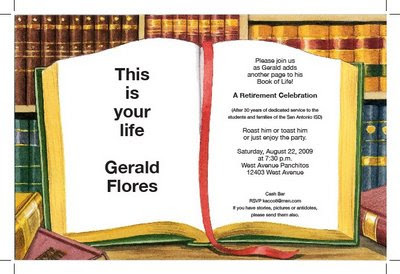 This is your Life, Gerald Flores, a retirement celebration, Saturday, August 22nd @ 7:30 p.m. @ West Ave. Panchitos, 12403 West Ave. Governor Rick Perry (photo) to Ceremonially Sign Senate Bills 93 and 297, Friday, July 31st @ 3 p.m. @ The University of Texas at San Antonio – 1604 Campus. Main building, 1st Floor, One UTSA Circle. The HW Act provides an exemption of tuition and fees, other than the deposit and student service fees for up to 150 semester credit hours (also excluded are any fees for books, lodging, board or clothing) to an eligible Texas veteran. This legislation clarifies how the Texas veteran can establish his/her eligibility for HW benefits; it does not make distinctions between citizens and legal residents on educational benefits for veterans. Therefore, the bill aligns the state HW benefit with the GI Bill. Additionally, the legislation allows a veteran to transfer his/her unused HW benefit to his/her child. Also, the legislation allows the spouse of a fallen veteran to utilize the unused HW benefit if the veteran was KIA, MIA, or totally disabled. SB 297 - In-state Tuition & Fees (LVP, Ogden/Corte) Allows non-Texas veterans and their families to immediately pay in-state tuition and fees at a public university or college without requiring that they wait the one year to establish Texas residency. Additionally, if a military parent is deployed to a combat theater, that parent's child(ren) is(are) exempt from paying resident tuition at a public institution of higher education while that parent is on such a deployment. St. Paul's Catholic School, 307 John Adams. "Educating children in the spirit of Christ yesterday, today, & tomorrow." 50 Years of Tradition...A Faith filled Future"
I was born and raised in San Antonio, Texas. I attended Robert E. Lee High School and graduated in 1975. I received my BA in Goverment from the University of Texas at Austin and my law degree from UT at Austin in 1983. Over the past 26 years, I have enjoyed a wide variety of experiences in my legal endeavors. In 1984, I was hired by the Texas Attorney General's Office and was assigned to the Criminal Law Enforcement Division. From 1984-1988, I had litigated at all levels of both state and federal court, including the Texas Supreme Court and the United States Supreme Court. I returned to San Antonio in 1988 and held the position of Assistant District Attorney until 1990. During my stint in the DA"s office, I was assigned to numerous divisions, including the Family Violence Unit, where I both prosecuted criminal cases and obtained Protective Orders on behalf of women and children.In 1992, I was appointed to a full time position of Judge by the City of San Antonio. I held that position for two years.Since 1994, I have owned and operated the Law Office of Gabe Quintanilla, where I handle both criminal and civil matters. I also work parttime for the City of San Antonio as a Judge.In 1995, I was elected as Trustee for the North East Independent School. From 1995-2005, I represented the southern portion of NEISD and advocated for the reconstruction and refurbishment of the schools in that location. 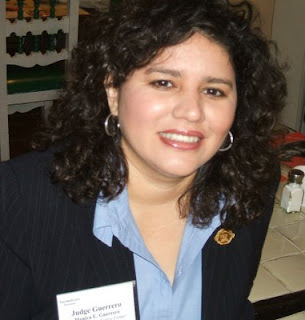 In 2000, I was elected as Chairman of the Bexar County Democratic Party. I held that position for four years and helped raise more money for the Bexar County Democratic Party and local candidates than anyone else in recent memory. During my political career from 2000 to 2004, I have been interviewed and quoted by local, state and national media, including the New York Times, the Washington Post, the CBS Evening News, ABC, NBC and various cable programs including, but not limited to, the Dan Abrams Report. 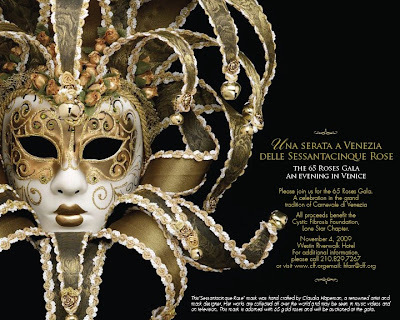 November 4th @ the Westin Riverwalk Hotel. For more info call: 829-7267. 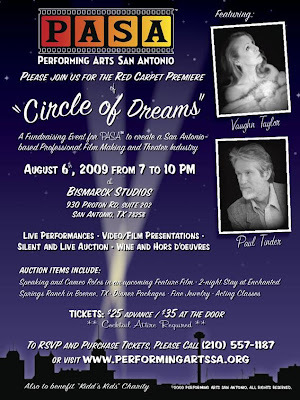 PASA presents the Red Carpet Premiere, "Circle of Dreams" August 6th from 7-10 p.m. @ Bismarck Studios, 930 Proton Road. #202. Tickets are $25 advance, $35 @ the door. For more info call: 557-1187.